During all these years Sweet Seeds® carried out a painstaking work of plant test and selection to create a catalog full of diversity that each grower can easily find its favorite cannabis strains. Being one of the world’s leading banks in the production of Cannabis seeds, each new release is turned into a challenge to be achieved by the Sweet Seeds® R&D team. As some of you might imagine, there are many parameters that play a role when evaluating a new genetic in order to determine if it is suitable for distribution. It is also important to consider the tastes and personal preferences of each grower but what a good breeder ultimately brings to a new strain is an adequate balance between all of them. In order to find a strain that is easy to grow, with a high germination rate, vigorous growth, moderated size and suitable for both indoor and outdoor grows, allowing for high yields, with excellent effects and tastes, Sweet Seeds® relies on a large team that struggles every day in the research and improvement of genetics so that everything goes perfect when you grow them. For some reason they are one of the seed banks with more Cannabis Cups in the whole Spanish territory. 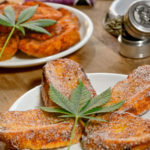 Concurring with this celebration and as the main part of this article, they announce and release one of the many new strains that they have prepared for this year of 2017. It is time to present the brand new Crystal Candy Auto® (SWS61). When I see a new strain with such a positive performance and, simultaneously, with a taste and effect so well balanced, it is difficult not to recommend it to my friends. I am telling you this while I taste a good vaporization of Crystal Candy Auto®, harvested about one month ago and I can say that day after day I enjoy it even more. It is the kind of strain you can 100% enjoy not only while growing it but also while smoking or vaporizing it. This new autoflowering comes from a cross between the latest photoperiod-dependent stain released by Sweet Seeds® in 2016 – Crystal Candy® (SWS58) – and an autoflowering strain with very similar aromatic tones: Sweet Special Auto (SWS35). The combination of both genetics results in a very aromatic plant, with compact structure and dense flowers covered by trichomes. The effect is very clear, leaning to the Sativa side. This strain can be harvested 8 weeks after germination. It features very vigorous and accelerated growth, producing multiple side branches and a big main cola. Taste and aroma are absolutely great and you will love it if you enjoy plants with fruity, sweet and exotic tones. A plant to fall in love with. From my point of view Sweet Seeds® designed a new autoflowering variety with its own character, exuberant taste and high yield. Taking in consideration the results obtained in my grow, I am sure most of you will agree with me once you try it. I usually share grow diaries in different cannabis forums in which I put all my effort to show in the best way possible the techniques I use to grow my plants so that everyone can compare results. When I write an article for a magazine I always do it the same way and from the moment I open the seed package I pay special attention to the modus operandi, so that it is as clear and clean as possible, always respecting the plants and giving them a dignified and pleasant life. All the love you give them will be given back to you. But in this case the beginning was not so benevolent for the 6 Crystal Candy Auto® seeds that I soaked because the germination occurred simultaneously with a lack of coordination with a friend of mine who keeps the soil in his house and so the plants were nearly 10 days without a pot with soil. 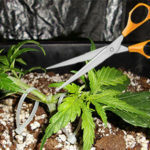 As many of you know, because you are enthusiastic growers, delaying the transplant of an autoflowering plant recently germinated always has consequences, particularly in the final size of the plant. And, therefore, a decrease in the final yield is also inevitable. This time span is crucial for their normal development because autoflowering plants start to grow slower by the 4th week of life when flowering begins. Luckily, and thanks to the fact that the 6 seeds were still alive after my friend came back, I hurried to give them a good soil and an adequate pot for the cycle and light potency that they were going to receive. In this case 600W High Pressure Sodium for a cycle of 20 hours of light and 4 hours of darkness, from germination to harvest. I keep both air extraction and intraction working almost in a continuous way and inside the closet there are also two medium-sized fans and a heater that keeps the temperature above 18ºC. I recommend keeping the temperature stable between 18ºC and 28ºC with moderate humidity, between 40% and 80%, as this ensures that plants always have the right growing conditions. As this grow matched with the Autumn rainy season there was no need to add humidity, which remained stable. I used 10 L and 20 L Airpots. By using two sizes I can see the difference between them and then decide which ones to use in the future. But I usually prefer the 20 L ones because they make the task much easier. In addition, since Airpots feature side holes, the soil dries much faster, so the smaller ones required continuous watering. This is good because it allows us to raise the watering frequency and you can obtain big harvests but, in my case, I prefer to choose bigger pots that make cannabis growing easier although at the cost of loosing yield. With autoflowering strains I always use the same soil I would use with any other Cannabis strain. According to this I make sure that the plants have enough food for the first 4 or 5 weeks of life. It is important to help with bio stimulators to promote the growth of roots and flowers. Using a root bio stimulator helps the plant to generate outstanding root growth, which is ideal to improve nutrient absorption and, most importantly, to keep the plants in perfect health. I recommend the use of the flowering bio stimulator whenever the plant reaches to a certain height and the first pistils appear, indicating the beginning of flowering. In this grow I started using it at day 28, when the first flowers started to appear. At that time they had an average height of 35 cm which does not reveal their maximum potential, but considering the initial delay I could not complain. All the plants were very healthy and at this moment there was no need to add anything else to the water besides flowering bio stimulator. This was the main fertilizer that I used because almost all the other nutrients that Crystal Candy Auto®needed were already present in the soil mix. The most critical moments happened between the sixth and the seventh week, when some plants started to ask for more nutrients, especially the taller ones. Besides that, being in smaller pots they consumed the available nutrients very fast. If this is your case, you can add some blooming fertilizers. They usually also need a bit of Calcium and Magnesium at this stage, but this time I did not have to add it. I only gave them blooming fertilizers twice because they always looked very healthy, with shiny leaves and an outstanding flower structure. Adding nutrients when a plant does not demand them tends to cause undesired accumulation of salts and usually blocks correct nutrient intake. If you pay attention to the pictures you will see that the plants were never hungry and the flowering formation was great. By the way, the bloom nutrients used were totally organic. Crystal Candy Auto® produces large central and lateral buds. Once flowering begins it becomes worth of admiration because the pistil and crystal production is extreme, leaving all the buds and their surrounding leaves fully loaded with trichomes. By the end of the 7th week the plants reached to their final height, with between 50 cm and 70 cm. The plants that were grown in 20 L pots ended up with a more robust structure and produced side branches with compact buds, while the plants grown in the 10 L pots grew a bit taller. With each watering the differences in the flower formation of both pot sizes was perfectly visible. The flower bio stimulator used at its highest dose together with the vigor of Crystal Candy Auto® were the perfect combination for an explosion of pistil production in the buds. While avoiding to saturate the soil with several types of fertilizers I managed to get healthy plants without any spots by the end of flowering. Maybe they missed that extra week of growth but I can not complain about the final results. After observing the way they develop I think that this strain may be very adequate to Low Stress Training techniques (LST). You can try to do this or other type of technique that is not too aggressive to the plant, allowing it to level its side branches with the main bud. You will probably be surprised with the results. They were harvested with 60 days from germination, just before I made a video and a good photographic session that you will be able to see on the Internet very soon, together with the pictures shown in this article. I could not weight the harvested flowers but I can estimate that it was very close to a gram-per-watio grow operation. 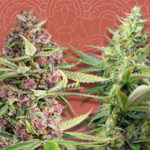 The flowers of this magnificent strain feature a sweet, wild fragrance, with shades of mature fruit and acid hints that are reminiscent of melon or strawberry. It is one of these aromas that make you want to stick your nose inside the bud for a long time to be able to discover it. You can already imagine the taste of the buds after they cure for a while. It is Iberian chorizo, as my colleagues like to label good marihuana. For this article I used a couple of buds that were already very well cured. After I used one in the vaporizer I was able to taste the freshness of Crystal Candy Auto®, full and very powerful in the mouth. If features a lot of mature fruit hints, between acid and sweet. The effect is noticeable after a very short time and allows for a truly lucid and creative feeling. The other bud has been rolled into a joint that I just finished smoking right now and, as you might well imagine, nothing compares to the pure taste of the vapor but I have been a smoker for many years and for me the best way to evaluate weed is in the form of a joint. This allows me to compare it with all the other strains that I have tried in the past. Vaporized Cannabis is usually very fresh and pleasant in the mouth, but not all the weed is equally good when you put them into paper and set it on fire. This one is excellent and very rich in aromas, filling your lungs and pleasing your sense of smell. I hope you enjoy this strain as much as I do and that you find space for this beauty from Sweet Seeds® in your next run.